You are browsing the Blog for Project Updates. Banggai Cardinalfish Books Have Shipped! The Banggai Cardinalfish, 304 pages, Hardcover $44.95, Quality Softcover $34.95. It’s another great week for all the Banggai Rescue Project. Tuesday, September 3rd, we began shipping hardcover and softcover copies of our book, Banggai Cardinalfish: A Guide to Captive Care, Breeding, & Natural History. Copies destined for US addresses were shipped via USPS Priority Mail on Tuesday, which means most recipients in the US should have them. If you haven’t received your copy by perhaps Sept 12th or so, drop us an email so we can track your copy down! Most folks have received them, and feedback has been overwhelmingly positive. International copies were shipped on Wednesday, September 4th. These will take longer to arrive, potentially significantly so; your patience is again appreciated! eBook recipients should expect something very soon as well (possibly as early as this coming week); we’re simply finalizing the details prior to distribution. Any outstanding rewards our team owes you are being worked on; a couple backers must wait just a little longer for special embellishments in their books, limited edition giclee prints, or original art. Any other outstanding rewards should be wrapped up in short order to the best of our ability. I think I speak for all of us when I say we’re very happy to see the light at the end of the tunnel for this chapter of the Kickstarter project! Additionally, wholesale orders are now shipping from Two Little Fishies – www.twolittlefishies.com for resale purchases. If you have any questions, please do not hesitate to contact me (team member Matt Pedersen) directly via email – matt.pedersen at reef2rainforest.com and I will personally address your inquiry. Thank you yet again for all your patience and support. HOLLYWOOD, FLORIDA – The long-awaited book from the Banggai Rescue Project will be launched at the Marine Aquarium Conference of North America here, August 30 to September 1. Ever wonder how you get a signed copy of a book when there are numerous co-authors residing in places like Minnesota, Maine, and Florida? One might assume that you simply ship a crate of books around, but the costs to actually do so would be exorbitant. No, the solution is far more elegant. As we draw ever closer to the 2013 MACNA release of the Banggai Rescue Project’s publication Banggai Cardinalfish, adhesive book plates are making their way from Shelburne, Vermont, to Duluth, Minnesota, to Rockland, Maine, to Tampa, Florida, collecting signatures along the way. Yes, one more sign that our long awaited book is truly, finally here. For our Kickstarter Backers who are due a physical copy of our book, you’ll be receiving an email directly from co-author Matt Pedersen regarding your attendance at MACNA this year, and whether you would like to pick up your copy of Banggai Cardinalfish in Miami. We look forward to wrapping up any and all outstanding Kickstarter Rewards very soon! Thanks again for the ongoing support you’ve given this project. Set to launch at the Marine Aquarium Conference of North America (MACNA 2013) in South Florida, The Banggai Cardinalfish book represents almost two years’ of work and the involvement of hundreds of saltwater aquarists, marine biologists, aquarium industry leaders, and many conservation-minded supporters. For a preview of the book, see this video by Matt Pedersen that runs through the entire 304 pages in about a minute and shows the scope of the international Banggai Rescue Project. The book will be distributed by Julian Sprung and Two Little Fishies in partnership with Reef to Rainforest Media, publishers of CORAL and AMAZONAS Magazines. Ret Talbot • Matt Pedersen • Matthew L. Wittenrich, Ph.D.
with Martin A. Moe, Jr., Roy Yanong, V.M.D., and Thomas Waltzek, D.V.M., Ph.D.
Books will be available at MACNA, August 30 to September 1 at the Two Little Fishies booth. Announcements coming soon about how to order the book. A year ago, I was preparing for a trip to Indonesia to immerse myself in the world of a small reef fish called the Banggai cardinalfish with the intent of contributing to an important book on the species. Editor James Lawrence recently sent me a revised copy of the manuscript (including some absolutely stunning layouts shown here), and it has me thinking back over the past year and the places this project has taken me both physically and intellectually. It also has me thinking about getting the book into your hands! While travelling halfway around the world to better understand a fish and its relationship to its environment and the fishers who interact with it is something to which I am not unaccustomed in my line of work, there was (and remains) something different—something very special—about the Banngai cardinalfish project. For one, it has been a much larger project than any of us anticipated, and the challenges along the way have been significant. From lengthy delays in getting the science done right to dealing with our own losses of broodstock secondary to the very virus about which we were writing, everything seemed to take twice as long as expected. Having said that, what we have learned has reinforced the importance of embarking on the Project in the first place. We have made the internal decision to take the time to do it right, and while we know the delay is frustrating, we think the final product (which is now over 300 pages–about 35% more than projected!) will more than justify our decision. As you know, we had originally planned on having the book signed, sealed and delivered last September, a timeline that, with hindsight, seems absurd. Speaking for myself, I thought I had a pretty good handle on the species and the fishery. After all, I have been covering it since 2008. I knew I needed to get up to speed on the virus impacting the species and the current fisheries data, and I knew I’d need to dig a little deeper into the species-specific physiology (with the help of my scientific illustrator wife and her microscope, of course), but that wouldn’t take that long, would it? It did…and it has…and it continues to. Take a lot of time, that is. When I work on any project, be it a blog entry, a feature magazine article or a book, I feel a deep sense of responsibility to give the reader as full a picture as possible, not because I want to tell the reader what to think, but rather because I want the reader to have enough information on board to engage intelligently in the dialog. To me, promoting discussion on topics I think are important is my number one job as a writer. When it comes to the Banggai project, we have found a space full of controversy and politics, conflicting information and strong emotions. Capturing the many facets of this story, while also trying to work with divergent groups and navigate a geopolitical minefield inhabited by NGOs, international fisheries managers and a marine ornamental trade dealing with a host of its own controversial issues (many of which are both directly and indirectly tied to the Banggai cardinalfish) has been one of the most complex assignments I have undertaken. Collaborating with international partners has proved logistically challenging but essential. Dealing with a story that keeps evolving (I just got a call last week that could have major implications on several key aspects of the book), can be exasperating. Following each twist and turn has meant travelling thousands of miles, reading countless pages, taking multiple notebooks full of notes, and shooting more images than I care to edit. In all this, I want you, the reader, to know you have been on my shoulder. Whether you are an aquarist, a diver, a biologist, a fisheries manager, an aquaculturist, or any number of other epitaphs of potential readers of this book, I have tried to keep you in mind—and my responsibility to you—throughout the process. All of us who have worked on the Project have gone way beyond the work for which we knew we would be compensated, because the work has become a passion—because we care so much about the role this book can play in promoting critical conversations. Attempting to package all of this into a book that will encourage intelligent and essential dialog about the species and its future has been an extremely difficult and yet an infinitely rewarding experience. As I work my way through the draft manuscript James sent me, I am growing increasingly excited to get this book—and more importantly—this information out into the world. As I look at the layouts the team at Reef to Rainforest in Vermont has put together, I become more and more enthused about what we have accomplished and how that will soon be handed over to you so you can take the next step. So what does this all look like in pragmatic terms? It means we are woefully behind our original timeline, but it also means we are rapidly closing in on a publication date of a book about which we are very proud. As we have asked already, we continue to request that you indulge us. Those of you who subscribe to CORAL and AMAZONAS know the very high quality of production for which Reef to Rainforest is known, and producing a book of equal quality and beauty takes time, but we think it’s worth it. As much of the work has now shifted to production and moving quickly toward presses running, Karen and I here in Maine are freed up to get the next set of rewards into the mail. Most of you should either have some of your rewards already in hand or have a tracking number that was emailed to you. For the higher-level donors, we need to hold off just a little bit longer (sorry! ), as some of you are receiving original artwork that is also appearing in the book. We decided to send everyone who made any contribution to the project, a notecard set, including three notecards featuring a scientific illustration by Karen and three notecards featuring a photograph by me. Those will be coming via USPS in the next two weeks, so be on the lookout. If you have any questions about any of these rewards (or anything else), please feel free to email me directly at Ret@RetTalbot.com. While we are eager to get these tokens of appreciation of your support into your hands, we want you to know we are also keeping our eyes on the prize and getting the best possible book published as soon as we are able. Dr. Gerry Allen with first live specimens of Banggai Cardinalfish he collected in 1994. Note expelled Banggai Cardinal fry in bottom of bag, the first clue that the species was an extraordinary mouthbrooder. Image by Roger Steene. Editor’s Note: For many of us, Dr. Gerald R. Allen, known throughout the aquatics world as Gerry, is one of the living heroes of reef fish science. A protégé of the legendary Dr. John Randall, Gerry has personally found and described a tremendous array of new fish species and published a wide-ranging library of marine guidebooks and scientific papers, while persevering in efforts to preserve marine species diversity in the Coral Triangle. As the ichthyologist who introduced the Banggai Cardinalfish to modern science and the aquarium hobby, Gerry has graciously lent his support to The Banggai Rescue Project. Here is an excerpt from his Foreword to the soon-to-be-published Banggai Cardinalfish book, coming from the publishers of CORAL. By Gerald R. Allen, Ph.D.
My personal quest for this extraordinary fish began just over 20 years ago, when I received a photo of an unusual discovery taken by a diver friend, Kal Muller. Kal took the photo during his recent visit to a remote island off the eastern coast of Sulawesi. The wide-angle shot showed a group of apogonids sheltering near a Long-Spined Sea Urchin. It was definitely something special. In fact, I had never seen such a spectacular cardinalfish and assumed it certainly must be new to science. Somehow I would have to find a way to visit the Banggai Islands and collect this fantastic fish! It took two more years before I was able to arrange travel to the Banggai Islands, as a side trip in conjunction with a biodiversity conference I planned to attend at Manado, in northern Sulawesi. Timing would be tight as there were only two flights per week to Luwuk, the jumping-off point to the Banggai Group. I invited frequent diving companion and renowned underwater photographer Roger Steene to join the mini-expedition. The trip was arranged for mid-November 1994. We would fly to Luwuk on the Thursday flight, make a quick visit to the Banggai Islands, hopefully collect and photograph the fish, and return to Manado on the Sunday flight. It didn’t leave much margin for error, but the busy conference schedule didn’t allow for extra time. Pterapogon kauderni, photographed in 1994: a cardinalfish unlike any other. We arrived at Luwuk around noon and spent most of the day arranging passage on the Banggai ferry and shopping for snack foods. The ferry finally departed at midnight and we prepared for a sleepless night on deck with the throng of about 100 passengers, vehicles, and livestock. But to our pleasant surprise we were able to bargain with the captain, negotiating the hire of his personal quarters for 50,000 rupiahs, probably more than he would earn in salary for the entire voyage. The cabin was very small, but nevertheless comfortable. There were two beds, a fan, and an adjoining toilet, and room to spread out the photographic equipment. The journey took 12 hours, but the time passed quickly, especially as we were able to sleep in relative comfort. The last hour of the voyage was spectacular, as the ship negotiated a narrow passage between two jungle-clad islands. At last the vessel docked at the main wharf at Banggai. It was 12:00 noon and time to put our much-discussed plan into action. We didn’t have any time to spare; the ferry would depart in six hours. We hired the ferry’s radio operator, whom we nicknamed “Sparky,” to accompany us because he spoke a few words of English. As soon as the ferry was securely tied Sparky went ashore to hire a small motorboat, and within 30 minutes we were headed south along the western side of the island. Kal had given us vague instructions—he had found the fish near a wooden jetty at a pearl oyster farm owned by a Chinese man, in a bay about one hour by motorboat south of Banggai town. Sparky relayed this information to our driver, who nodded in recognition at the mention of “orang cina,” the Indonesian translation of Chinese man. Several pearl oyster farms are located along the coast, but evidently only one is owned by a Chinese person. Forty-five minutes later we pulled in to a narrow wooden jetty at one side of a picturesque bay. Banggai Island jetty, 1994. Image by Roger Steene. It was a race to be first in the water. In less than a minute we were both submerged, but the fish was nowhere to be seen. I finned slowly away from the jetty, methodically checking every square metre. Kal had previously located the fish in only 6.5 feet (2 m) of depth, so the search was limited to shallow water near the shoreline. The bottom was an uninteresting blend of sandy silt and clumps of seagrass. After a dozen breath-hold dives I sorely missed the luxury of our usual scuba equipment. I inhaled another big breath and plunged down. Swimming close to the bottom, I rounded a large patch of seagrass, and suddenly there it was—a group of about 10 adults huddled around a long-spined Diadema sea urchin. It’s difficult to describe the level of excitement at that moment, but suffice it to say there was a maximum adrenalin surge. The beauty of this fish in its natural habitat is something to behold. The combination of a striking color pattern and long, graceful filaments on the dorsal and tail fins is truly spectacular. We had to work fast. I calculated we should spend no more than three hours at the site to allow ourselves ample time for the ferry departure. Further searching revealed several more groups, invariably huddled close to urchins, including a large aggregation containing more than 50 fish. Our first priority, and the most time-consuming chore, was underwater photography. Over the next two hours we took more than 200 shots. This, of course, was the predigital era, so after each 36-shot roll we had to tediously exit the water, towel off, and change film. Finally, with only half an hour remaining, it was time to collect a small sample. This proved a simple task, as the fish retreated among the sea urchin spines where they could be easily sandwiched between a pair of small hand nets. The first attempt yielded six adults, which were summarily placed in a plastic bag. One of the fish spat out an orange-coloured egg mass—not unusual, as male cardinalfishes are well known for their habit of oral egg incubation. A few more specimens were captured and placed in a separate bag. I could scarcely believe my eyes when I checked the second bag a few minutes later. There were more than two dozen miniature replicas of the adult fish that apparently had been expelled from the mouth cavities of two large fish that appeared to be incubating eggs, judging from their swollen throats. Brood care of live young was previously unknown in cardinalfishes. Soul of a marine biologist: Pinning out a collected specimen for preservation and further study on the sole of a flip flop. Back aboard the ferry, I carefully pinned out the fins of the collected fish and preserved them in formalin solution for later study. We were ecstatic that our carefully laid plans had unfolded with clockwork perfection. Not only had the fish been successfully photographed and collected, but we also gained a sneak preview of its unusual lifestyle and breeding habits. To make things even sweeter, I thought this amazing fish was a new scientific find. However, detailed examination of the specimens in my laboratory at the Western Australian Museum and a review of taxonomic literature proved this assumption to be wrong. The fish had already been described! My investigations revealed that two subadult specimens were collected at Banggai Island in 1920 by a Dutch physician named Kaudern. The specimens had been sent to the Natural History Museum in Leiden and the species was eventually described in 1930 as a new genus and species, Pterapogon kauderni. It seems hard to believe that this magnificent fish escaped the attention of collectors for decades, considering that Indonesia is a leading exporter of marine fishes for the international aquarium trade. However, it remained elusive thanks to the lack of a pelagic dispersal stage typical of most reef fishes and the consequent extremely limited geographic range, confined to an area seldom frequented by outsiders. Suddenly the Banggai Cardinalfish was thrust into the limelight, becoming an overnight sensation. I recounted the tale of its rediscovery at the Louisville MACNA Conference in 1995, and again in an article that appeared in the May 1996 issue of Tropical Fish Hobbyist Magazine. This was followed by a brief scientific paper reporting our observations of its natural habitat and unusual oral brooding habits. Showing the first collected Banggai Cardinalfish to the Chinese owner of a pearl oyster farm where the species was found in abundance in 1994. Members of the Banggai Rescue expedition returned to the oyster farm in 2012 and found the fish’s population seriously reduced. Image by Roger Steene. I have experienced a certain degree of guilt for having triggered interest in this species, which almost overnight became one of the most popular species in the aquarium hobby. Considering its limited distribution, I was particularly disturbed to discover that thousands of specimens were being captured and exported each month—not an ideal conservation scenario for a fish that is geographically restricted and produces relatively few eggs compared to most reef fishes. It is therefore particularly gratifying to see the initial results of the ongoing Banggai Rescue Project presented in this book. Hopefully, this welcome addition to our knowledge of this fascinating species will lead to reforms of the overfishing situation in the Banggai Islands and a solution to the baffling iridovirus problem that has had such a severe impact on imported specimens in recent years. Importantly, this book also includes the latest information for successfully rearing and maintaining Banggai Cardinalfish in captivity, a positive step that will certainly reduce the demand for wild-caught fish, thus making a valuable contribution to the conservation of the natural population. Addendum: On a subsequent visit to the islands in 1997 I had an opportunity to dive in Banggai Harbor, including next to the ferry jetty. To my surprise the Banggai Cardinalfish was exceedingly abundant among the jetty pylons and elsewhere around the harbor. Had we known this, we could have saved lots of time and energy, not to mention angst, on our initial 1994 visit. The Book: Now in its final stages of production, the Banggai Cardinalfish book will be published in the spring of 2013. Starting with this excerpted Foreword and continuing with a first-hand look at the Banggai Cardinalfish in its native habitat, the book covers the fish’s natural history, conservation status in the wild, reproductive habits, and ways for small-scale breeders to become local suppliers of captive-bred Pterapogon kauderni. To sign up to receive notice of the publication date and to order the book, visit: Banggai Cardinalfish. The first round of Banggai rewards are departing Maine next week for your doorstep as we draw nearer to fulfilling our mission . Thanks to everyone once again for their support, and once again we’re sorry for the delay. The final results of the scientific work conducted in both Indonesia and Florida have just been received and reviewed, meaning that, with a couple small tweaks, we are ready to move toward press. It’s been a bit too long perhaps since our last update, but those who’ve been following Banggai Rescue on Facebook have gotten many smaller updates over the past several months. For those of you who didn’t make it to MACNA a couple weeks ago, Banggai Rescue authors Ret Talbot and Matt Pedersen, and artist Karen Talbot, were all on hand talking about our project. Ret Talbot’s presentation at MACNA – Cardinal Directions – was the first in-depth insight into the team’s journey to the Banggai Traingle (as dubbed by Dr. Matt Wittenrich). Ret is currently giving this presentation around the country at various local aquarium clubs – be sure to catch it if you can. Pedersen’s presentation, The Aquarium Ark, touched on issues of breeding the Banggai Cardinalfish (Pterapogon kaudernii) with regards to conservation and genetic integrity. Karen Talbot created a fantastic birch-board painting of a Banggai Cardinalfish during the three days at MACNA, this original work was one of the Sunday raffle prizes at the end of the show. 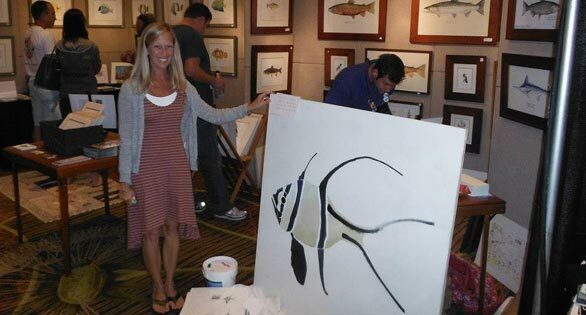 Conservation artist Karen Talbot takes pause to pose with an in-progress Banggai Cardinalfish piece she ultimately completed during the three days of MACNA in Dallas, TX. Image: Ret Talbot. As many of you are hopefully already aware, the team opted to push back the publication of our book for, among other reasons, the need to wait for a data set to be completed. But we didn’t want you to think that nothing has been happening. This project generated no less than 8,000 images (Matt Pedersen alone), so more likely the team produced tens-of-thousands of images to be sorted through. Most of the book is written at this time as well; again, we’re waiting on a few key puzzle pieces to come together to wrap it up. I think everyone agrees that rushing to produce a semi-complete book, simply to hit an arbitrary deadline of being ready for “MACNA”, wouldn’t have been the right choice. We thought you might appreciate a digital sneak peak of our work. MACNA attendees received a large tri-fold Banggai Rescue handout at the show, and you can download a full digital PDF version here. The Banggai cardinalfish is a unique fish for many reasons, not the least of which is the extremely restricted geographic range this species has historically occupied. This is a fact the Banggai Rescue international science team saw firsthand today as we travelled by speedboat from our field headquarters in Bone Baru village in the north of the Banggai Archipelago to Bone Bone village in the southeast, Toropot village in the southwest, and then back to Bone Baru. As our boat alters course slightly to quarter a building swell, the late afternoon light bathes the interior of the cabin in a golden hue. Although tired from a full day on (and in) the water, the fact we just covered the bulk of the Banggai cardinalfish fishery in a single day is not lost on any of us. Given that the geographic extent of the fishery is fairly consistent with the geographic extent of the fish’s endemic range, the potential impact of the fishery on the species is profound. This is especially the case given the lack of effective fishery management, the level of illegal fishing we have observed, and what we have seen in the way of collateral damage to appropriate Banggai cardinalfish habitat secondary to destructive fishing practices (e.g., blast fishing and cyanide fishing). While we are confident the samples we have collected throughout the fishery will yield concrete results that will help us better understand the species and the virus which is contributing to well-documented mortality in trade, our attempts to better understand the fishery itself by conducting interviews with fishers, fishery managers and others involved with aspects of the Banggai cardinalfish trade has, at this point, yielded more questions than answers. Can the Banggai cardinalfish fishery in the Banggai Islands sustain current levels of fishing for the marine aquarium trade, especially given other pressures on the resource such as illegal and destructive fishing practices and land-based threats like uncontrolled clearing of native forests for agriculture? Will the recommended reduced monthly quotas proposed by local stakeholders be adopted? If the quotas are adopted, will the resources be available to enforce those quotas? Are the recommended quotas consistent with what the science shows to be sustainable harvest levels? What impacts has the introduction of culled, confiscated and captive bred Banggai cardinalfish had on the naturally occurring populations? The Banggai Islands are a place of sublime beauty, and while we no doubt appreciate this splendor as we close in on the rugged magnificence of Banggai Island and the promise of another delicious dinner provided by our hosts in Bone Baru, we’d be dishonest if we did not acknowledge today has left each of us somewhat disheartened. By no means are we suggesting the Banggai cardinalfish, its fishery or the fishers and fisher communities who depend on it are a lost cause, but there is much work to do. We, the Banggai Rescue International Science Team, now more than ever feel a deep responsibility to contribute meaningfully to the ongoing dialog about this very special fish and, in turn, the aquarium trade that has, most recently, put this species on the map. Stay tuned, as you can rest assured there is lots more to come. To see more photos and brief updates from the team in the field, be sure to “like” the Banggai Rescue Facebook Page. Observing Wild Banggai Cardinalfish in Banggai Islands! The KM. Valentine 2, a presumably seaworthy ferry with a perceptible list softened somewhat by a cheery complement of passengers and crew, slipped its berth amid the rush and bustle of Luwuk Harbour at just after 9 pm. Bound for Salakan, the capital of the Banggai Islands, the ferry’s three decks are abuzz with activity. Banggai Rescue’s international expeditionary team gathers at the stern beneath an inky black sky punctuated by a swath of bright stars. Only one member of the team, Yunaldi Yahya, M.Sc., had spent time previously in the Banggai Archipelago, so the rest of us are a bit like kids on Christmas Eve. After so much time dedicated to studying and working with the Banggai cardinalfish, it is hard to believe it is nearly here—the moment we will see the fish in its namesake isles. The Banggai Islands, a vestigial set of microcontinental plates severed from the northern extent of New Guinea, collided with Sulawesi sometime in the Late Miocene…or so we’ve read. This geologic fender-bender created a deep ocean trench between mainland Sulawesi and the Banggai Islands, and this deepwater is thought to be one of the barriers that has contained the Banggai cardinalfish within the Banggai archipelago. For most of the Team, crossing this trench is significant, for it represents a concrete demarcation between the wild Banggais we had already observed outside the species’ endemic range and the ones we will soon be seeing living within their native habitat. Arriving in Salakan a little after one a.m., the Team, bleary-eyed and luggage-laden, slouched down dirt streets in a sleepy haze to a nearby hotel for a few hours of sleep before meeting up with our contacts from Fisheries in the morning. Thanks to the work and relationships established through our host organization—Yayasan Alam Indonesia Lestari (LINI)—we have a local Fisheries’ speedboat at our disposal throughout our stay in the Banggai Islands, making it possible to cover a large portion of the archipelago in a compressed timeframe. While no doubt tired after the long trip from Bali to Sulawesi and eventually onward to the Banggai Islands, it’s no problem getting out of bed at first light. We are finally here—in the Banggai Islands. Re-tracing our steps back to Salakan’s small harbour, we eagerly boarded a remarkably comfortable and fast boat for the trip around the northern extent of the island of Peleng to the village of Bone Baru on Banggai Island. Bone Baru has become the de facto epicenter of the legal Banggai cardinalfish fishery, although, as we have previously reported and will discuss at length in the book, the majority of the actual fishery remains illegal. Making fast to the long pier extending from the village’s main street, we disembark and made our way into town. Invited to join some of the locals for decadently sweet hot coffee and the always amusingly awkward conversation resulting from loose translations, gesticulations and plenty of laughter, we immediately fall in love with Bone Baru and its residents whose kindness and generosity appears to know no bounds. This will be a very good base of operations for the Banggai Rescue international science team while in the Banggai Islands. As charmed as we are with the village, and as much as we are enjoying getting to know its residents, we’d be lying if we didn’t acknowledge our burning desire to get in the water, where we are confident we will come face-to-face in short order with the objects of our study. Happy to oblige, a few local fishers accommodate our request, and soon we are donning masks, snorkels and fins and heading out over the shallow grass flats and sandy bottom of Bone Baru’s shallow bay. Within moments, the first populations of Banggai cardinalfish come into view. Hosting around coral colonies and anemones living within the grass beds, it is difficult to move on from one grouping to the next. The groups themselves are not terribly large, but each provides an opportunity to assess, observe and simply be enchanted by the fish’s distinctive (and, anthropogenically-speaking, “cute”) pulsing movements closely choreographed with a persistent gentle swell and the undulations of the long blades of seagrasses against a kaleidoscopic backdrop of shoals of small fishes surging through the sun-slivered shallows. As mesmerized as we are, the need to return to work soon gets the best of us. A couple local fishers are kind enough to show us the various collection techniques they have traditionally used to fish for Banggais. For anyone familiar with the species and its behavior, it will not come as a surprise to hear us report on how easy it is to collect very large numbers of this fish in extremely short order. Of course this is one of the primary concerns about the fishery and its sustainability. While there is a proposed quota of 15,000 Banggai cardinalfish leaving the Banggai Islands through the Fish Quarantine and Inspection office per month, we know from our previous interviews with exporters and middlemen in both Bali and Java that the actual numbers are far larger. Still, we are encouraged to learn from the fishers in Bone Baru that there have been changes to the fishery that are moving it toward greater sustainability. The question, of course, is are these changes significant enough and happening quickly enough to positively impact the endemic population. We are very much looking forward to the upcoming days of observing and sampling Banggai cardinalfish populations from across the species’ endemic range. Of course it will be important to see if we can identify the Banggai cardinalfish iridovirus (BCIV) in wild populations within the Banggai Islands, but it will also be noteworthy to hear anecdotal reports from a wide variety of fishers about the fishery. Relying in part on team member Yunaldi Yahya’s experience mapping Banggai cardinalfish distribution and densities throughout the islands, we will hopefully have a rare, first-hand look at places where the species is doing better and, unfortunately, places where local extirpation has occurred. Stay tuned for more information from the Team, and thanks again for your invaluable support of this important project! Copyright © 2012 Reef to Rainforest Media, LLC. "BANGGAI RESCUE" is a trademark of Reef to Rainforest Media, LLC. All rights reserved. Use of text or images from this site without written permission of the publisher are expressly forbidden. See Media Support in Contacts for approved downloadable text and images.